Please contact me with any food-related questions or requests. You can leave a comment on any of my posts, or you can email me at PictureRealFood@gmail.com. I will do my best to answer all genuine questions and requests as soon as I can. 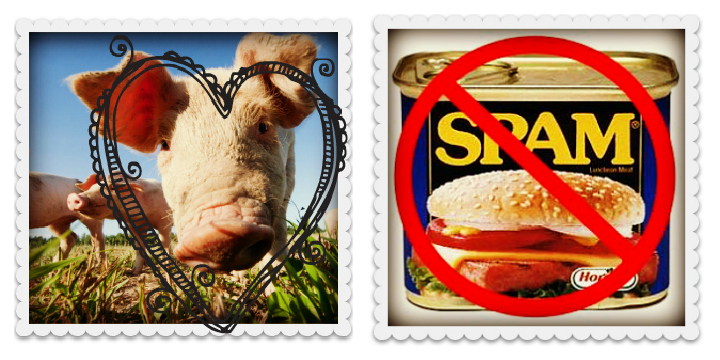 At Picture Real Food, we don’t entertain Spam in any capacity! Happy, lovely pigs, not sad, processed pig(s). © Picture Real Food, 2013, All Rights Reserved. Unauthorized use and/or duplication of the material contained within the blog PictureRealFood.com without express and written permission from this blog’s author and/or owner is strictly prohibited. Excerpts, photos and links may be used, provided that full and clear credit is given to Picture Real Food with appropriate and specific direction to the original content. Thank you for following my blog. I hope you enjoy it. Pinky. We love your blog so much that we nominated you for a Liebster Blog of the Year Award (see our post about it).